Take Home Maui started out as a road side fruit stand in Lahaina in 1978. They would stock the fruit stand with pineapples from the fields each morning, and collect the papayas, apple bananas and mangoes from their Aunties’ yards. If the surf was up, they’d close for the day. Lahaina was a magical place in the 70’s. There were very few tourists, and no one locked their doors at night- typical of a small town located in a tropical paradise. They were raised with the idea that the most important thing in life was to give back to the community, and live aloha. 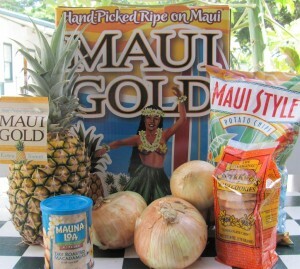 Over the years, Take Home Maui grew with Lahaina and Maui. The island of Maui, now voted by Conde Nast magazine as the best island in the world for 5 consecutive years, is truly a premier vacation destination and boasts some of the most beautiful resorts in the world. Fortunately they have not lost their rural essence. Most of the land there is still devoted to farming and agriculture and the fertile, volcanic soil produces the sweetest pineapples, onions, sugarcane and coffee in the world. Even though Take Home Maui has been nominated for the Hawaii Governors Exporter of the Year award for the past three consecutive years, they still operate out of their original store, a 75 year old plantation home in Lahaina, one block off Front Street. They have a warehouse in Kahului, near the airport, where their workers pack boxes for visitors to take back home with them on the plane, or have delivered to their door via FEDEX. 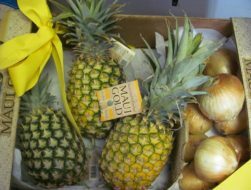 Other pineapple companies have come and gone over the years, but Take Home Maui has found that being dedicated to excellence and service keeps people coming back. For more info give them a call 808-661-8067 and visit them on the web TakeHomeMaui.com.